We are entering into a world where driverless vehicles will eliminate millions of driving positions; robotic systems will work relentlessly day and night eliminating millions of manufacturing, welding, painting, and assembly positions; and things that seemed impossible to automate in the past will have computers and machines replacing people’s jobs. At the same time, the amount of time it takes to build ships and skyscrapers, create massive data storage centers for all our growing volumes of information, or produce global wireless networks for all our devices has dropped significantly. But along with each of these drops is a parallel increase in our capabilities and our expectations. LAW #1: With automation, every exponential decrease in effort creates an equal and opposite exponential increase in capabilities. LAW #2: As today’s significant accomplishments become more common, mega-accomplishments will take their place. LAW #3: As we raise the bar for our achievements, we also reset the norm for our expectations. As you read the rest of this column, you’ll find an abridged version of the Three Laws of Exponential Capabilities. Full version here. LAW #1 – With automation, every exponential decrease in effort creates an equal and opposite exponential increase in capabilities. When it takes less effort to do something, we naturally do more things. This has been proven out time and again throughout the centuries. To illustrate this point, here are three industries that have radically changed humanity over the past centuries – Transportation, Photography, and Media. 1.) Transportation: Thinking in terms of our travel capabilities, if we use the average transportation speeds in Richard Florida’s “Great Reset,” we can extrapolate an exponential growth in the number of miles the average person will travel over their lifetime. 1850 – Average speed 4 mph – Traveling 4 miles per day X 50 year life expectancy = 73,000 miles. 1900 – Average speed 8 mph – Traveling 8 miles per day X 60 year life expectancy = 175,200 miles. 1950 – Average speed 24 mph – Traveling 24 miles per day X 70 year life expectancy = 613,200 miles. 2000 – Average speed 75 mph – Traveling 75 miles per day X 80 year life expectancy = 2,190,000 miles. 2050 – Average speed 225-250 mph (projected) – Traveling 225 miles per day X 90 year life expectancy = 7,391,250 miles. We have transitioned from slow and difficult forms of transportation to fast and painless. Going from 73,000 to 7.3 million miles in a lifetime is a 100X increase in human mobility. 2.) Photography: The famous photograph titled, “View from the Window at Le Gras” by Nicéphore Niépce in 1826, was one of the first photos ever taken and the oldest surviving one. Photography started as a slow and arduous process in the 1800s requiring exacting precision and lots of time. With the introduction of cheaper and better cameras, film, and processing the number of photos taken began working its way up the exponential growth curve. But it wasn’t until recently, with the birth of digital cameras in our phones and free storage, that the number of photos per day really took off. LAW #2 – As today’s significant accomplishments become more common, mega-accomplishments will take their place. It is no longer reasonable to assume the same mega-project that have challenged us in the past will be the same size and scale of the mega projects that will be needed to challenge us in the future. Living in a world where our ever-expanding use of automation and AI is reducing the human contribution in nearly every achievement, we are also witnessing a dilution in the value of past benchmarks. For this reason, a new generation of mega accomplishments are beginning to surface. Even though tube travel like this will beat every other form of transportation in terms of speed, power consumption, pollution, and safety, the big missing element is its infrastructure, a tube network envisioned to combine well over 100,000 miles of connected links. While many look at this and see the lack of infrastructure as a huge obstacle, it is just the opposite, one of the biggest opportunities ever. Constructing the tube network has the potential of becoming the largest infrastructure project the earth has ever seen, with a projected 50-year build-out employing hundreds of millions people along the way. LAW #3 – As we raise the bar for our achievements, we also reset the norm for our expectations. 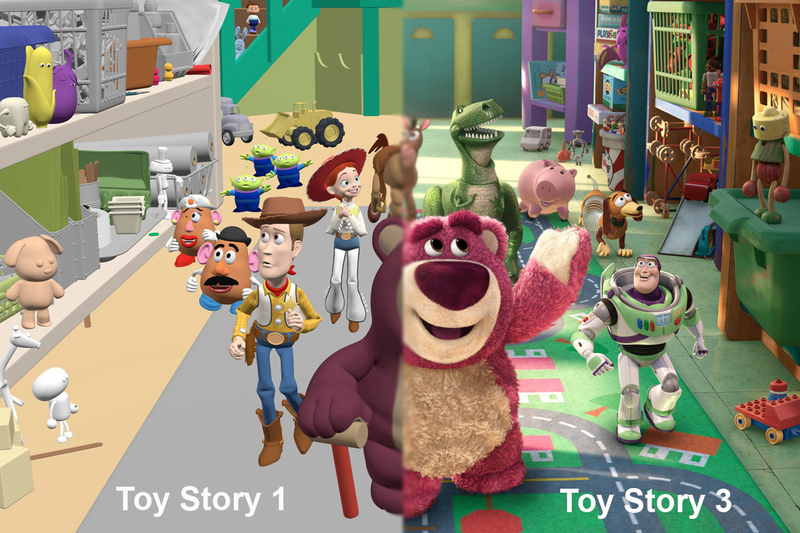 When Pixar released the first Toy Story in 1995, it was the first feature film to be produced entirely with computer animation. Naturally it looked a little rough around the edges compared to the new stuff, but it represented a massive breakthrough in the way animated films were produced. Whether it’s building the Great Pyramids in Egypt, erecting the Great Wall of China, or sending someone to the moon, crazy-big projects have a way of defining our humanity and raising the bar for future generations. As our capabilities improve, we simply need to set our sights higher and aim for the stars…. literally! Naturally there are a few downsides to our expanded capabilities. Addictions can become exponentially more addictive. Dangerous people can become exponentially more dangerous. And global conflicts have the potential of becoming exponentially more disastrous. With all of our increased capabilities, perhaps the one we are lacking the most is our ability to anticipate problems. That said I‘d love to hear your thoughts. What’s missing, what needs to be reworked, and where is this most and least applicable? We will all be spending the rest of our lives in the future, so we all have a vested interest in understanding it better.